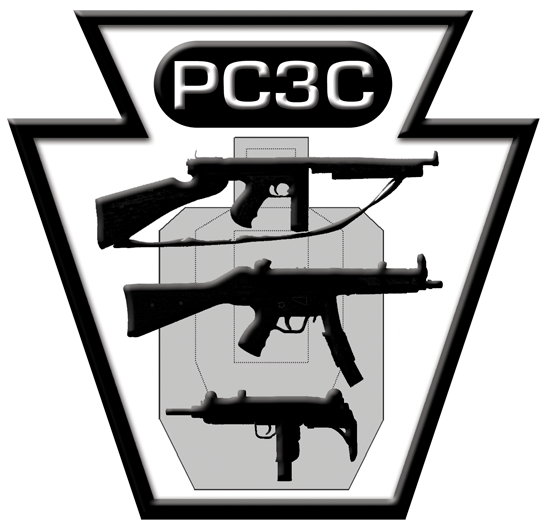 PC3C stands for "Pennsylvania Class Three Competitors" and is an organization which conducts submachine gun and other firearms competitions. Founded in 1995 by a group of individuals who had been competing and training under the now defunct National Firearms Association* for several years, PC3C regularly held NFA sanctioned competitions until 2003. Recently some of the old PC3C Range Officers were approached concerning restarting the organization and after finding that there was a large amount of interest, decided to conduct a limited number of shoots during the Spring/Summer of 2012. Utilizing fully automatic pistol caliber weapons, submachine gun shooting competitions take place across the United States every month in many states where firearms which fall under the National Firearms Act are legal. Although submachine gun competitions have been happening in the United States of America since the early 1980s, it is one of the least-known shooting disciplines due to the restricted nature of the firearms involved. To the novice submachine gun competitor the average match would have many of the same elements as an IDPA, IPSC, or SASS event with the only difference being the firearms used and the amount of ammunition carried. Usually competitors move through a stage while being timed as they navigate the course of fire (COF) and shoot various target types. Some of the firearms used are the Heckler & Koch MP5, Uzi, Colt 9mm SMG, Sterling, Mac-10, Sten, Thompson, Carl Gustav M/45 / Swedish K, and the MP40, as well as many others shooting 9mm, 45ACP, and 40S&W calibers. Most subgun competitions are run using the rules established by the NFA* or variations thereof.